Description Of Item: At long last, the original most powerful man in the universe is coming to toy shelves as a Comic Con exclusive! 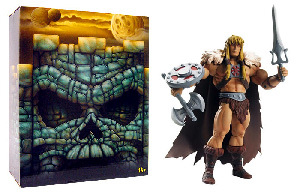 King Grayskull is the inaugural MOTU figure to feature super articulation and classic detailed sculpting by the Four Horsemen. Grayskull comes in a brand new package featuring lights and sounds which transforms into a mini Castle Grayskull playset.